Concerto No. 1 in B Flat Major K207 (Violin and Piano Reduction). Composed by Wolfgang Amadeus Mozart (1756-1791). Edited by Wolf-Dieter Seiffert. For Piano, Violin. Violin. Henle Music Folios. Pages: Score = III and 25 * Vl Part = 11. Softcover. 40 pages. G. Henle #HN706. Published by G. Henle (HL.51480706).This is not only Mozart's first concerto for the violin but his first concerto altogether. 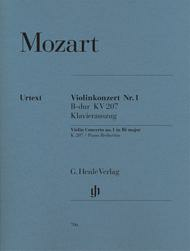 He composed it at the age of 17, writing it in Salzburg in 1773 two years before his other four violin concertos. And what a concerto it is! This new publication completes Henle's series of Mozart's violin concertos and single movements, all of which are now available in exemplary urtext editions with easy-to-play piano reductions.